Using the part number 1519-0153, the Jabra BIZ 1500 Quick Disconnect Duo Headset is an affordable choice for enterprises in need of a cost-effetive device to support their communication needs. Built to be durable, this headset is an excellend addition to an enterprise’s communication foundation. Jabra BIZ 1500 QD Duo Headset is integrated with the noise cancellation technology. Through this, the headset can help users in providing an environment with reduced noises that usual. Through the technology, users are able to concentrate on calls more and in the process improve customer experience. Jabra BIZ 1500 QD Duo Headset delivers crystal clear communication through the use of the HD Voice technology. It also has comfortable foam ear cushions and adjustable headband and boom arm. Call our company at Australia wide 1300 088 088 for your questions about this product. 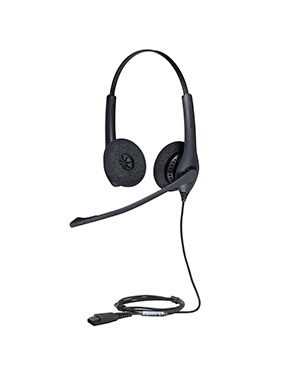 Jabra BIZ 1500 Quick Disconnect Duo Headset is the most ideal option for enterprises and customers in search of a low-cost yet innovative communication headset they can use for their operations. And since the device is comprised of excellent quality materials, the device is highly durable and can last longer than other competitive headsets, which ensures that users won’t have to replace them time and time again. In addition to that, the headset also has a boom arm that can be rotated around 270 degrees, without havng to worry about breaking it. The Jabra BIZ 1500 QD Duo Headset uses the HD Voice technology that ensures crystal clear, vibrant, and life-like communication. Thhe device also uses noise cancelling microphones, which reduces background noises and allows the person on the other side to clearly hear what has been said. The microphone is also air shock, which means that sharp breathing sounds are also reduced. This makes the headset perfect for crowded open spaces. The device also uses PeakStop, which instantly removes all harmful loud sounds and keeps sound level at safe range in order to protect user’s hearing. Jabra BIZ Quick Disconnect Duo Headset is structured for an all-day wear. It uses soft foam ear cushions, which keeps users’ ears cool and so won’t be uncomfortable for a prolong use. It boasts an ergonomically designed frame together with padded headband for addition comfort. The headset also has an adjustable headband and microphone boom that can be positioned to suit user’s preference. Jabra BIZ 1500 QD Duo Headset is a user-friendly device. It has a simple call management with intuitive control unit that can be used for greater call control. The device also uses Jabra Software Applications, which can be customised and can even provide users full integrated and remote call control with the help of the latest innovated softphones generation. It is also compatible with Jabra Xpress, which is a web-based solution for users to remotely deploy settings, firmware, and software for numerous Jabra USB headsets. Established in January 3, 1993, Jabra is the known leading brand of GN Netcom. Since its establishment, it continues its journey towards developing innovative and high quality wireless communications headsets and solutions. It is also one of the fastest growing hands-free communication solutions suppliers in the global market. Jabra takes pride in the product line that GN Netcom considers the standbearer of the company. Jabra works under the Contact Centre and Office headsets division and the Mobile division, for the company to concentrate only on these divisions.